I think I've compared Jeff Lemire to many things to try and capture the precision with which he writes. I keep coming back to boxing because like the "sweet science," writing involves a balance of different approaches, short arcs, long flurries of action, combinations, and some huge knockout attempts. 'Descender' #12 is the start of a new story arc and it will leave you floored. Like so many of Lemire stories there comes an emotional crossroads that you know is coming but feels like a punch to the gut nonetheless. And such is the case with this issue. It pivots from the cliffhanger in issue eleven where TIM-22 attacks TIM-21 and delves right into 22's backstory. Lemire chooses to explore 22's motivations over what easily could had been an all-out brawl between bots as the introduction to this new arc. It will leave you shocked, empathetic, and conflicted when you witness 22's painful past. Being a boy robot it turns out can be frighteningly similar to being a human one. Eager to please, loyalty to spare, impressionable, and subject to abuse. You'll forget TIM-22 is an android designed for human companionship and see on the page a boy being physically and mentally abused. It's disturbing but it demonstrates the genesis of 22's fear of abandonment, jealousy, resentment, and anger. He can't let TIM-21 continue to take away the robot leader Psius' attention in fear that he'll be replaced and discarded once again. Those projections manifest in a murderous rage. This is where Lemire begins to jab at your feelings a little at a time. Short glancing blows that accumulate to break you down emotionally before he finishes you off with a dramatic upper cut to the chin with a devasting cliffhanger once again. I want the next issue now! 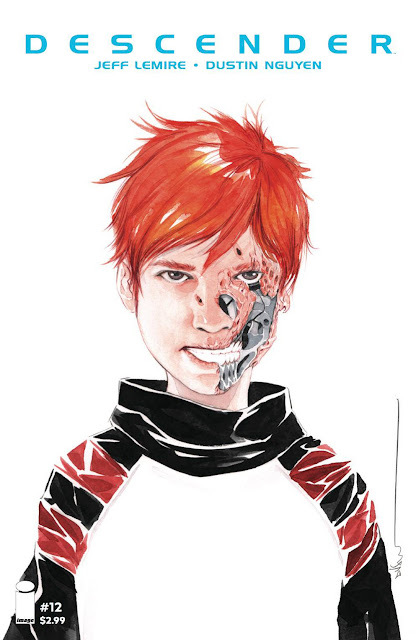 I've spent the last eleven reviews gushing over Dustin Nguyen's watercolors and number twelve is no different. The book is gorgeous and genius. Nguyen tells the story as effectively as anyone ever has told a story. From the dynamic layouts to the colors to the heartwrenching facial expressions there is nothing Nguyen can't do. I'm often dumbfounded by his wonderful technique. 'Descender' is back and while the main story hardly moves forward the reveal of TIM-22's backstory adds emotional weight to the present. Lemire once again shows why he's one of comics' best with a compelling issue that pulls no punches. Nguyen's art is predictably flawless and the new arc is totally accessible to new readers. It all goes by too fast but it's totally worth it.